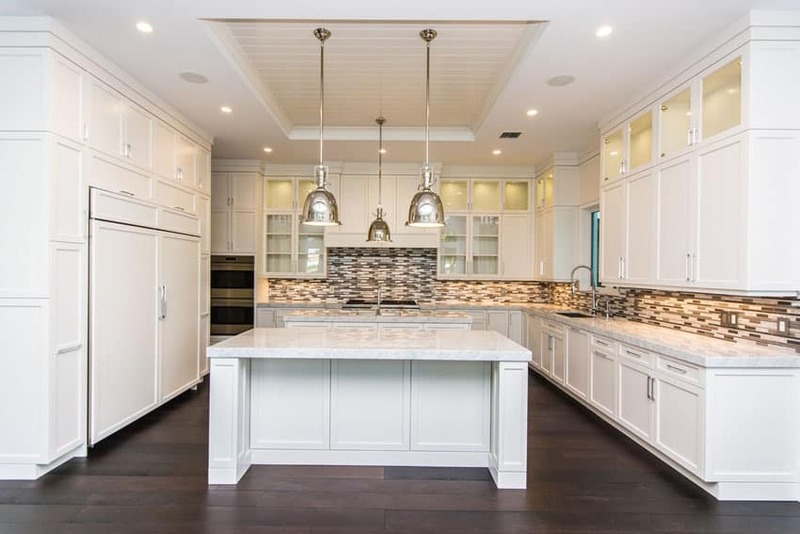 Kitchens with white cabinets are highly sought after due to their timeless beauty and ability to pair with traditional, country, contemporary, European, or modern styles. White cabinetry matches with all colors making it easier to match your kitchen appliances, islands, and back splash to get an attractive look. 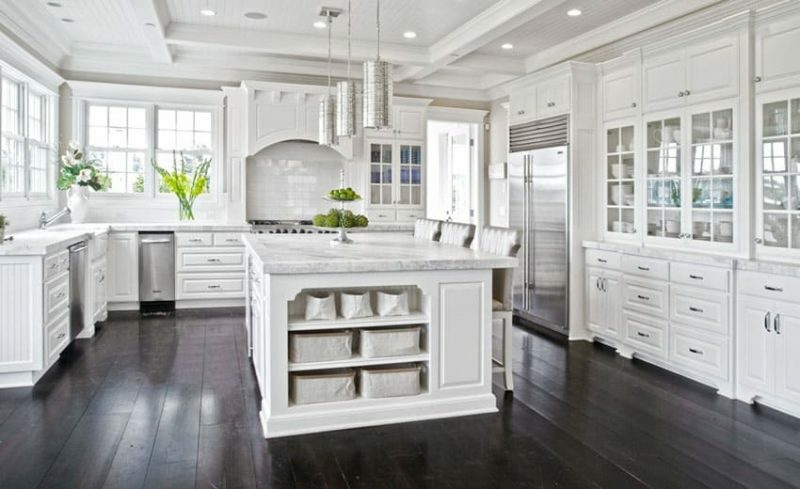 Below are a collection of gorgeous white cabinet kitchens for design ideas and inspiration. This elegant kitchen in the picture above stands out very nicely against the dark wengue flooring used throughout the space. The stark contrast between these two finishes gives a really bold look to the space, and doesn’t over-power each other at the same time. 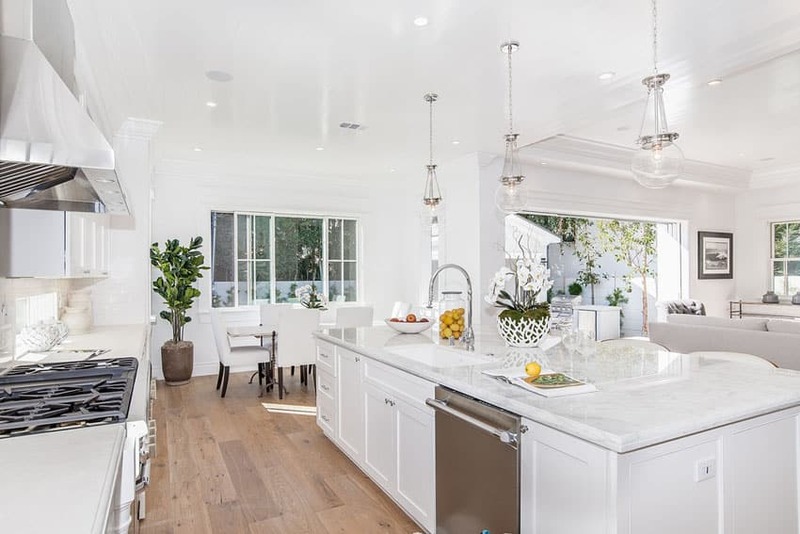 The kitchen has a nice all-white color scheme, using French-inspired kitchen cabinets, white marble counter top and pearly white and silver mosaic tiles for the backsplash. Contrary to the belief that white is too plain or boring, it actually provides more room for experimentation as it works like a blank canvass which offers endless possibilities in terms of visual aesthetics. To avoid the “lifeless” and dull look, one key guideline which may be considered in working with white cabinets for your kitchen is to create variation in textures, materials and finishes. In that way depth, dimension and contrast is still created even if you decide to achieve an “all white look” for your home. White also comes in a lot of tones so you can try to work with different shades ranging from the brightest ultra white to the more subdued creamy off white or beige. 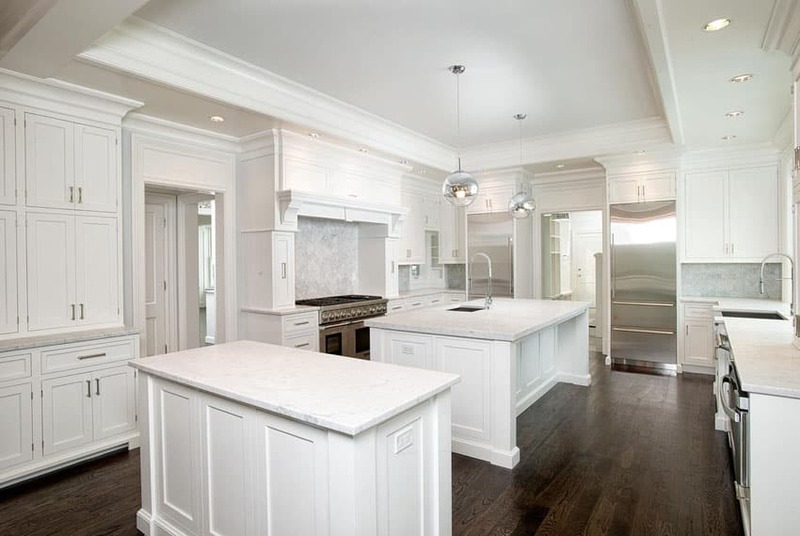 Millwork and cabinetry style is also a significant factor to consider when working with white kitchen cabinets. To make the design of your kitchen more cohesive with the overall look of your home, pay attention to small details and do not be afraid to spend on millwork. The addition of decorative moldings and raised panels to white cabinets, for example, make them more suited for the traditional style. A plain flat panel ,on the other hand, is more fit for a contemporary or modern setting. White kitchen cabinets provide more room for addition of splashes of color to the room to create more contrast. Add life to your kitchen by using a specific accent color for your accessories, small appliances or special finishes. One of the most common ways to achieve this is by using a stand out flooring material. Try out an interesting floor pattern lay-out if using ceramic tiles or choose a uniquely grained wooden floor plank. Aside from this materials, granite, natural stone or even concrete are the other options which can be explored as a flooring material for the kitchen. Creating contrast is also not limited to this alone as you can work with the small details in the kitchen too. Choose interesting finishes for cabinet doors and handles to create visual contrast. Do not be afraid to try out new colors for the kitchen appliances. Stainless steel appliances, for example, are a perfect match for white kitchen cabinets in a modern setting. The kitchen backsplash is also another way to add life to white kitchen cabinets. Mosaic tiles, natural stone and glass provide variation in texture and can serve as an interesting focal point for a kitchen with white cabinets. If this doesn’t suit your taste, you can also instantly create contrast by using a countertop material with a distinctive veining pattern or flecks of color. 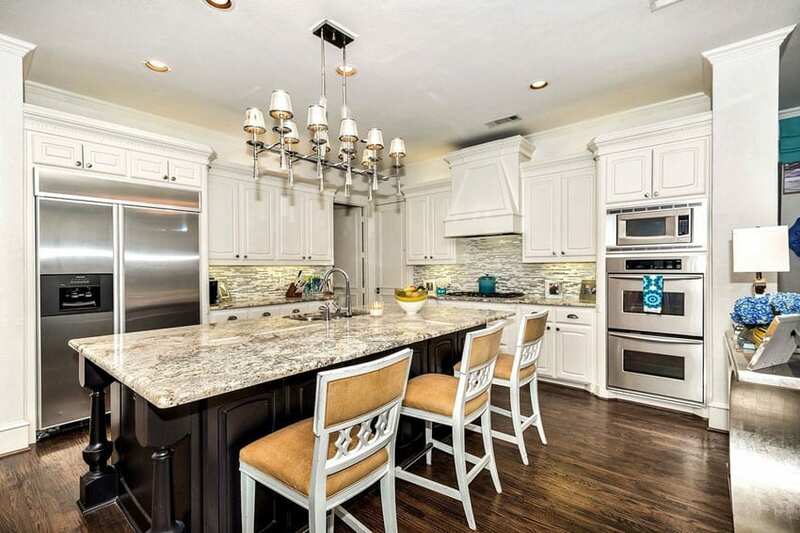 This beautiful kitchen uses dark chocolate oak flooring paired with all-white kitchen cabinets. The wood used on this one, however, has a bit more red undertone, giving it a slight purplish tinge, which helps the white cabinets stand out just as well as the wengue floors. The cabinets are classic-inspired, with simple paneling detail and French glass doors for the upper cabinets. It uses a thick slab of marble and white subway tiles for the backsplash for a sleek transitional style kitchen. Golden walnut floors provides an elegant and warm background throughout this space and gives a subtle contrast against the white kitchen cabinets. 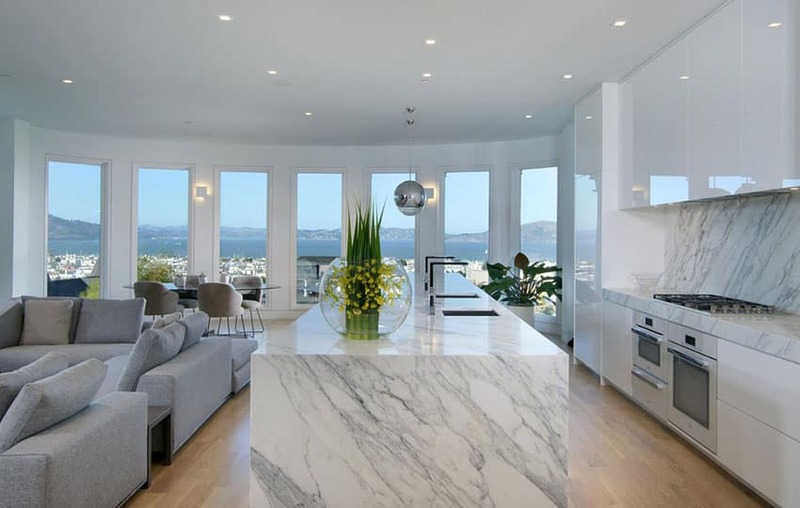 The kitchen uses modern paneled cabinets topped with black granite for the main counters and white Calacatta Vagli marble for the kitchen island. 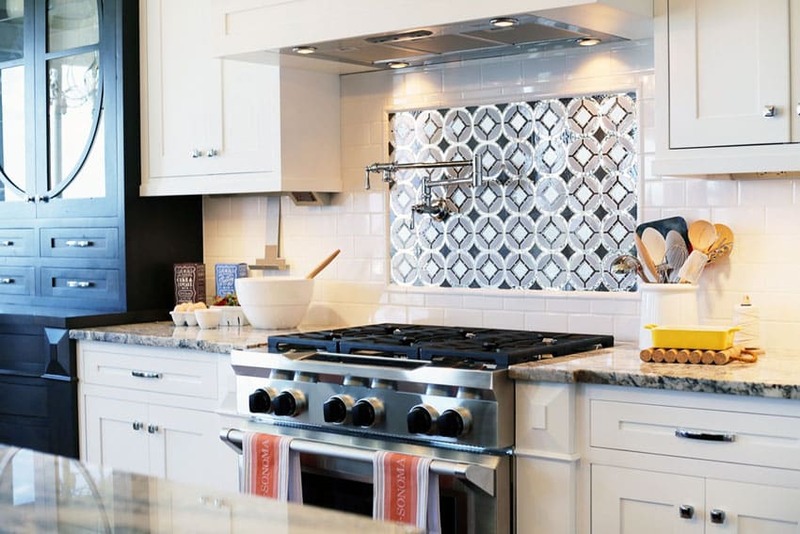 It also uses unique backsplash tiles with subtle silver quatrefoil pattern, which matches the pattern on the pierced stainless steel of the dining area’s pendant lamp. 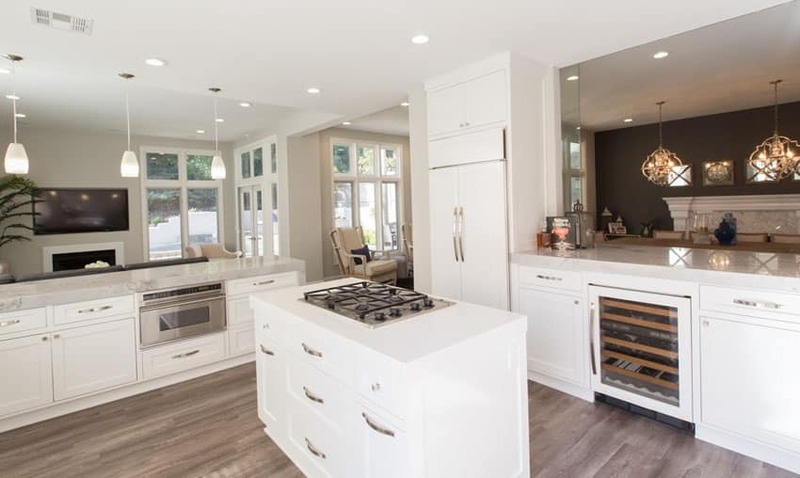 Unlike the previous examples, this kitchen goes for a light on light combination, using light maple wood floors paired with white kitchen cabinets. The subtle contrast in this kitchen is found on the walnut-based kitchen island and the single solid wood beam running across the ceiling. 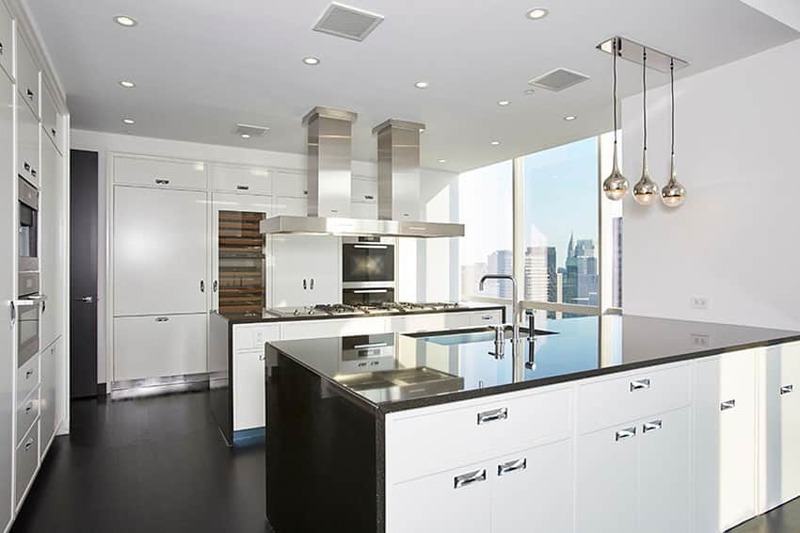 The kitchen itself is very simple, with off-white ktichen cabinets, glass panels on the overhead cabinet doors, and white subway tiles paired with white marble countertop. A large full-sized kitchen which uses elegant dark walnut floors with a nice matte varnish finish, which helps bring out the simple elegance of the all-white kitchen cabinets. 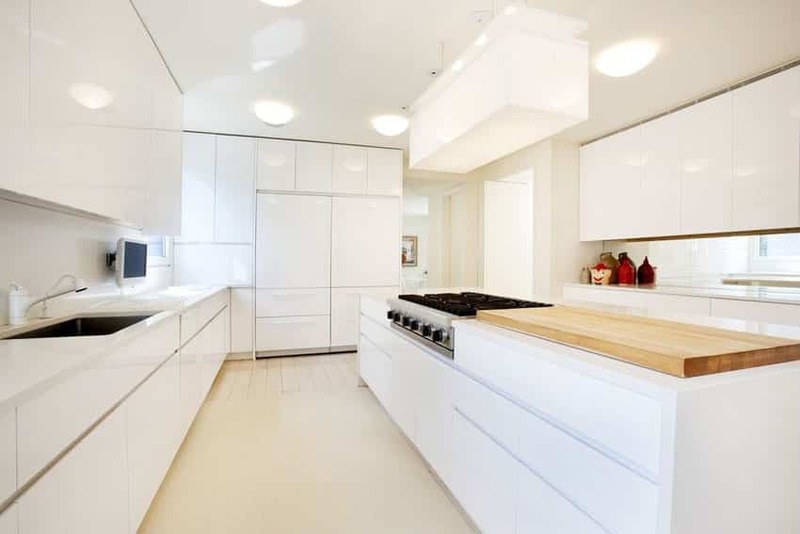 The bright white paneled cabinets really makes the space look fresh and clean, with a style that stays relevant for years. For an elegant touch, carrara marble was used for all the counter tops, paired with gray and white marbled tiles for the backsplash. 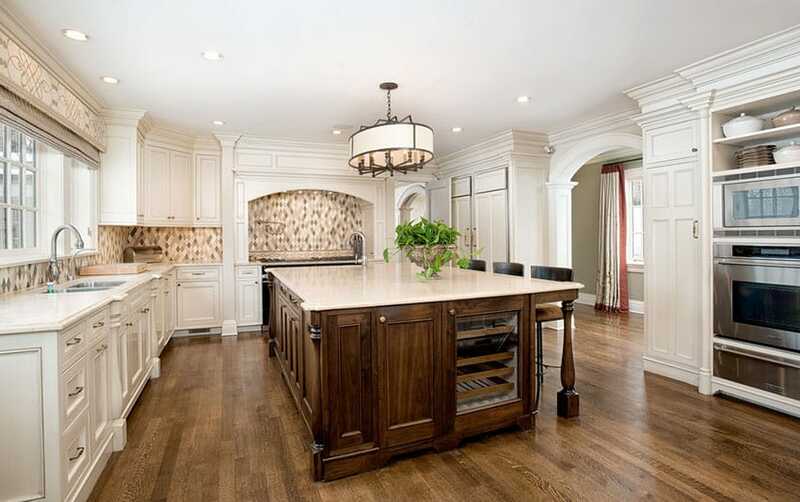 Two kitchen islands offer plenty of space for food preparation and eat-in dining. Golden walnut floors with matte varnish finish add a rustic flair to this bright transitional style kitchen. Unlike the previous examples which uses beige, taupe or gray painted walls, this space is white all though-out except the flooring. The warm and muted tone of the floors helps bring out the white cabinets, and makes it stand out. This kitchen uses a classic pairing of white marble and white subway tiles for the backsplash. A small kitchen which uses a combination of black and white finish for a very stark contrast. The main kitchen cabinets are finished in white, with simple panel design and stainless steel design, while the side display cabinets are finished in black. For the countertop, black & white granite was used for an elegant appeal without breaking the bank like marble. The backsplash uses a nice combination of white subway ties and patterned mosaic tiles, helping accentuate the cooking area. This kitchen has a retro feel to it because of the color and furniture choice. The floors are nice golden oak, adding a warm tone to the whole space, while the deep blue accent colors found on the barstools and the accessories adds a relaxing cool tone to the space. Cabinets were simple paneled cabinets in all white, topped with cream soapstone for a softer surface. Gorgeous golden oak floors set a warm and muted flooring on this kitchen, helping the white kitchen cabinets stand out. The cabinets are plain white with a simplified paneling detail, topped with gorgeous marble with coffee-colored grains/patterns. This modern white kitchen has a more rustic feel with its combination of colors and finishes. Dark oak wood floors make the white cabinets stand out, while the wood planks on the gabled ceiling were given a refreshing feel with a white paint finish. This kitchen adapts a semi-open layout, separating the kitchen from the rest of the house with the surrounding kitchen counters. For the countertop, a unique marble with subtle gold grains was used, adding a warmer feel to the space, and for the backsplash, marble finish ceramic tiles were used. This small kitchen shows a bit of Middle-eastern inspiration with its patterns/motifs, but has transitional style used throughout the space. Walls are light cream color, adding a subtle contrast, while floors are dark wengue ceramic tiles, helping the white kitchen pop out. For a cleaner, crisp look, white solid surface was used and paired with backsplash tiles with a unique quatrefoil pattern. Sea Foam green walls sets a cool and refreshing background to this small kitchen space. 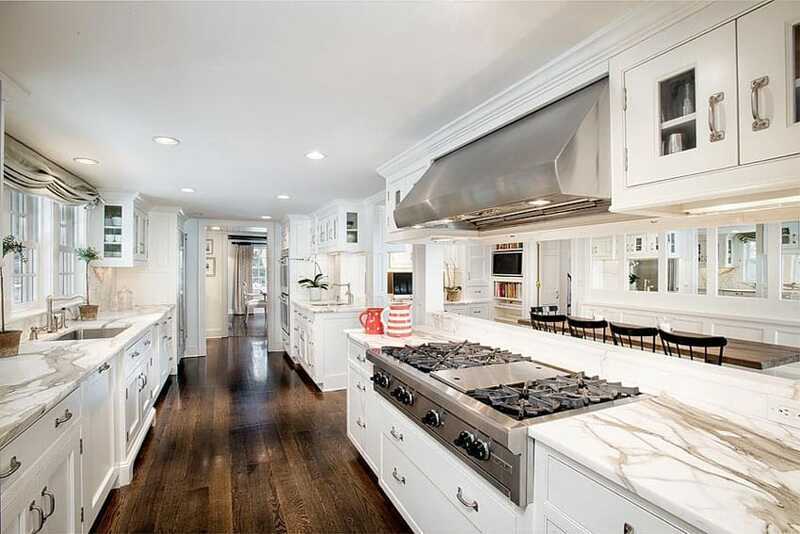 The all white color scheme of the kitchen helps make it look bright and spacious despite the limited space. It adapts traditional style kitchen cabinets paired with white marble with golden grain, and white subway tiles for the backsplash. Another traditional style kitchen which uses white-painted kitchen cabinets to give it a cleaner and lighter look, helping it blend in with more modern furniture pieces. The thick slab of green-tinged granite helps emphasize its traditional look, but its flat profile keeps it looking simple and modern. Provincial oak wood floors adds a nice textured look to this kitchen design, adding a subtle warm glow to the space. The kitchen cabinets adapts a neo-classic style, using classic motifs and French-style overhead cabinets. Black quartz counters gives a nice contrast against the white cabinet counters, which helps make the black-weathered finish of the kitchen island match with the over-all look of the kitchen. This small kitchen adapts a French provincial style, using all white for both the cabinets and the general surfaces. Despite the small size, the unique layout is able to maximize the available space, providing sufficient working surfaces, as well as a bar counter for dining. The black granite counter adds a touch of contrast to the all0white space, while the coffer ceiling and classic motifs adds texture and pattern. Kitchens with white cabinets that have an antique style and finish can give your space a more traditional feel. For those who seek the warm and inviting ambiance of antique white kitchen cabinets there are many ways to achieve the look you want. Antique white kitchen cabinets work best for traditional homes. Although classic, this kitchen cabinet style never look dated. This usually comes in a creamy beige, off white or distressed white finish. For those who want to achieve a more dramatic vibe, a crackled faux finish is also available to simulate an age-old look. This finish is usually combined with a paneled cabinet face design or a decorative crown molding. Since it is also stained and smudged, antique white cabinets are easier to clean rather than the pure white kitchen cabinets. Golden oak floors set the antique feel to this classic white kitchen design, which also perfectly matches the diamond mosaic tiles used on the backsplash of the kitchen. Traditional style cabinets painted in an off-white color were used, paired with walnut finish base for the massive kitchen island counter. 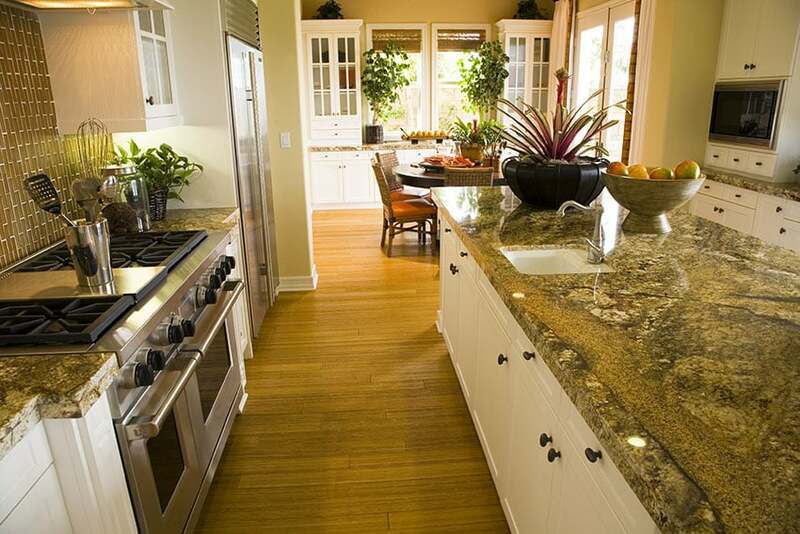 All countertops uses white granite, for a clean and bright-looking surface. Ebony floors makes the kitchen look like its floating, while the mustard-colored walls adds a warm golden tone throughout the kitchen. The kitchen cabinets has a classic Gothic inspiration, with intricate panel details and Gothic Arches on the overhead cabinets. The rest of the kitchen adapts a more modern transitional style, like the beveled white subway tiles used on the backsplash and the stainless steel drum lights above the kitchen island. This kitchen blends traditional elements with modern materials to achieve this look. 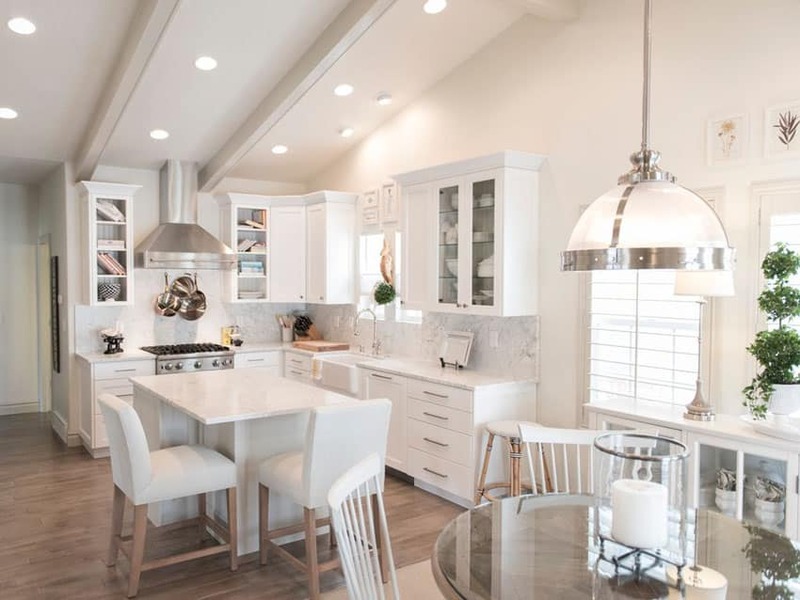 Its open layout helps make it look more airy and spacious, while its off-white traditional antique style kitchen cabinets gives it that classic elegant appeal. 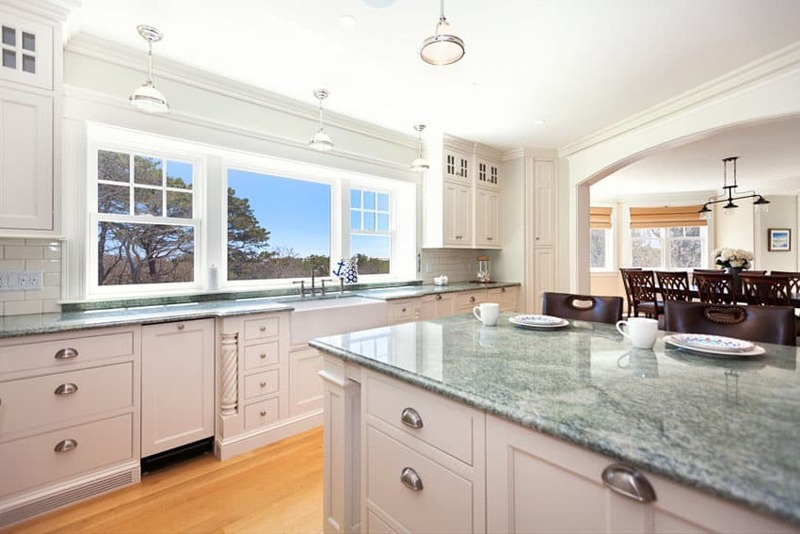 The main counters uses green granite counters and light gray mosaic tiles with green border tiles to match that of the counter top, while the parallel kitchen island opts for a more modern, black solid-surface counter top, with rounded edges. Beige or off white is a good alternative to white. This neutral color can be used as an alternative by homeowners who find white too dull or plain looking. 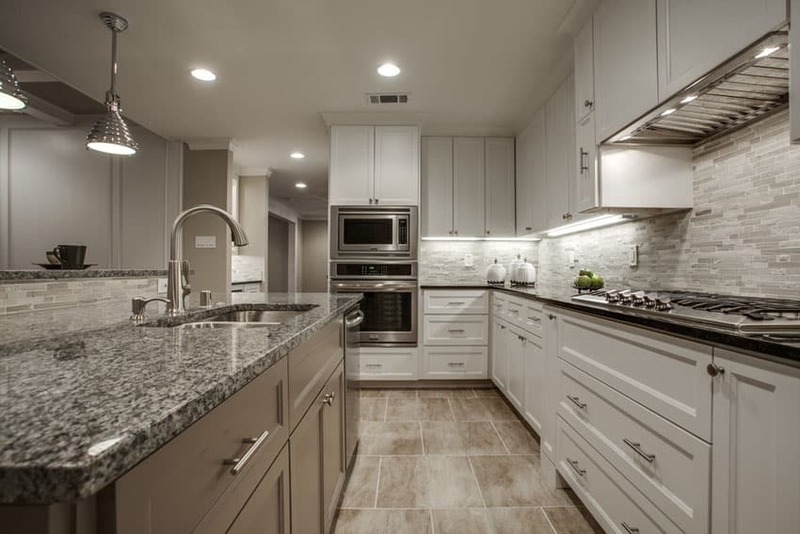 Compared to the crisp and bright color of white cabinets, a beige or off white color is more “creamy” and has a slightly yellowish tinge that gives it the right balance of a cool hue and a mellow hint of a warm undertone. Off white and beige cabinets tend to give a space a more cozy ambiance, making guests feel more at home and welcomed. Since it is also a light color, off white or beige cabinets also create an illusion of added space, making small kitchen appear bigger and more bright. Just like white, off white or beige cabinets can be combined with any color. Although off white cabinets are more prevalently used in classic and traditional kitchens, this cabinet color complements a wide variety of design styles,whether antique, old world, transitional, contemporary or modern. When it comes to matching with decor or countertops, off white and beige cabinets also offer versatility and flexibility. It works well with both light and dark countertops, but exudes elegance when paired with exquisite natural stone. Paired with the right millwork and flooring material, off white or beige kitchen cabinets can be used to create a beautiful and luxurious farmhouse, cottage and country inspired kitchen. Off white cabinets paired with emerald green granite counters give this kitchen a classic country vibe. The base cabinets creates a subtle contrast when paired with the pine flooring, adding a soft warm tone to the kitchen. Distressing is a type of faux finishing technique that is added to kitchen cabinets or furniture pieces to give them a weathered or worn out look. This is also used to give cabinets an antique feel or a rustic and laid back vibe. This is commonly used for kitchens which have a traditional style, country inspired or have an old world feel. A distressed finish can be achieved using simple materials and a ready made antiquing glaze. This can be undertaken as a “do it yourself” project. However, pre distressed kitchen cabinets can also be ordered from suppliers. This process usually involves a lot of sanding to get that weathered and worn out look and texture. Distressed white kitchen cabinets can be achieved through simple steps. The materials that are needed for this project includes smooth cotton rags, sandpaper or sanding blocks (use a 80 grit sandpaper), paint brushes and rollers. The paint or finishes which are used are white latex paint, acrylic glaze, antiquing glaze or glaze pigments. If you want a non shiny or non glossy finish, you can also use a non yellowing, matte polyurethane coating. The first step involved in creating distressed white finish is to prep your cabinets for the work by removing handles, knobs and pulls. You can also remove the cabinet doors if doing this finish for an existing kitchen to make the job easier. Also provide protecting covering to your walls and countertops using a painter’s tape and a plastic sheet. Then after that, make sure that your cabinets are clean. Wipe off any surface dirt using a damp rag and let it dry. You can use a mild soap or dish detergent and water solution to remove all dirt. Unlike with the usual repainting or refurbishing where you have to refine all surface cracks before applying your chosen finish, for the distressed white finish, you can also leave dents or minor damages in the cabinets before you start as they add charm and make the finish more natural looking. The next step involves sanding your cabinets using sandpaper or a sanding block. Stop when the wood under paint is already exposed. In order for the new antiquing glaze to adhere to the surface of your cabinets the original finish must be removed. Again, you need to wipe all the dust using a clean rag. Once the cabinets er completely clean and dry, you can apply the first coat of primer to your cabinets using a paint brush or a roller brush. For solid wood cabinets, use a standard primer, while if refinishing a high shine or glossy surfaces like a veneer cabinet, use the appropriate type of primer. Let the primer dry. Once, you need to lightly sand the cabinets again and clean any dust. After which, the base color of your cabinets can now be added. Use white latex paint as a base coat and apply this to your cabinets using a piece of cloth, instead of a paint brush. Do this in a circular motion. This process is done to achieve a distressed look. Two coats are needed – one applied after the other has completely dried. If your cabinets’ original color is already white, then you can skip this step. The corners, edges, groves and moldings of the cabinets may also be sanded to keep them more dark. If you want to add more details, a chisel may also be used to create “chips”. You can get more creative in achieving a more distressed look by using a hammer to obtain dents, however this finishing detail is more permanent compared to sanding. It is difficult to reverse so make sure that this is the exact effect you want to achieve before doing so. This approach to distressed cabinets is also effective only when used for solid wood cabinets. The next step involves the application of the antiquing glaze or acrylic glaze. The glaze is usually mixed with a tablespoon of your base color, in this case white. If aiming for a warmer look, add a tinting color which is yellowish or ochre in color. Umber may also be added if you want to achieve a gray cast to your white cabinets. Apply the glaze over the cabinet using a paint brush. Alternatively, you can also use a cloth rag if you want a smoother finish. The glaze should be allowed to sit in the surface for a couple of seconds then the excess is immediately wiped off using a rag. This process creates a streaky and antique look. Allow it to dry for at least ten minutes. If you want the finish to be more distressed, you can also use a steel wool. Also, sanding in between coats will also allow you to achieve a smooth finish. The glaze must be applied evenly but more focused on the worn out areas. Allow adequate time for drying. This usually takes 24 hours to cure completely. After drying, the top coat can now be applied. The top coat can e a matte polyurethane finish to give you cabinets a satiny final overall look. This also acts as a protective covering for the antique distressed cabinets. Once completely dry, you can now install your cabinet door hardware like pulls or knobs. Overall, the distressed finish is a quick and easy fix to make your cabinets exude with that timeless and elegant antique appeal. There is something alluring about white kitchen cabinets with dark floors. White kitchens can tend to look washed out and devoid of contrast. With the additional of rich dark wood flooring you can add interest and personality to the space. As mentioned earlier, the most common way to create depth and contrast in a kitchen with white cabinets is to pair it with an interesting flooring material. Wood planks in a darker color provide a dramatic, cozy and homey feel to your kitchen. It adds to the timeless, classic flair and gives warmth to the space. Dark floors are not limited to wooden planks alone as there are other flooring materials available in the market. Ceramic tiles come in a broad spectrum of designs and patterns. Granite and marble floor tiles also have different veining patterns and colors which work well with a luxurious traditional kitchen style. But for those who are more experimental, concrete floors create a grungy effect for Industrial themed kitchens. Classic elegance is demonstrated in this traditional kitchen design, featuring combination of colors and finishes which exudes both luxury and modern simplicity. While the main kitchen cabinets are plain white, the kitchen island has a dark redwood finish. Both are topped with light cream granite and paired with white and silver mosaic tiles for the backsplash. It also uses gorgeous Georgian style barstools with yellow velvet upholstery and white-painted wood frame. Gunmetal gray walls and dark mahogany wood floors create a dark and masculine vibe to this kitchen. 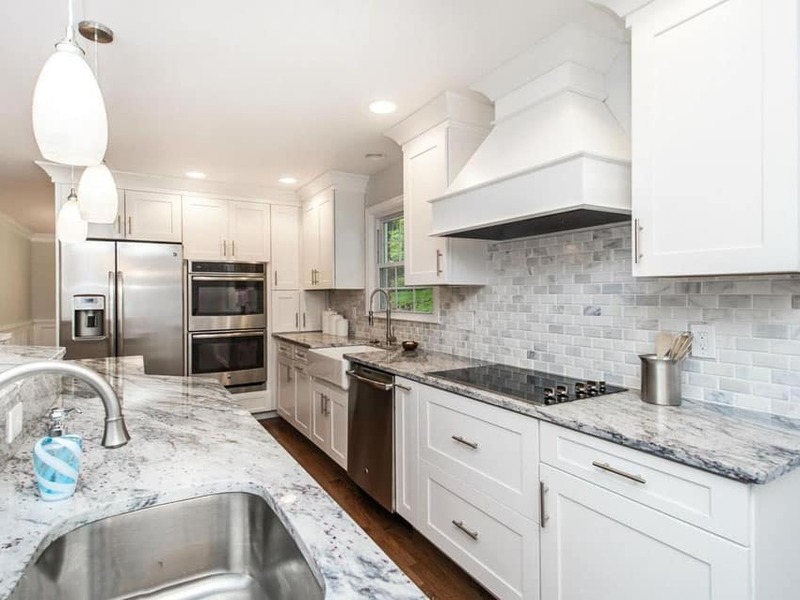 To counter this, instead of flat white, off-white/cream paint was used to finish the traditional style kitchen cabinets and paired with with golden yellow granite. This creates a nice balance of cool and warm tones, creating a modern and elegant kitchen space. Redwood flooring gives an overall warm feeling to the space, couple with large windows surrounding the whole exterior wall, making the space look bright. Because the basic finishes like the moldings and ceiling already use white, the kitchen cabinets were finished in a light cream/off-white color to give it a bit more variety, and the countertop uses Absolute black granite. 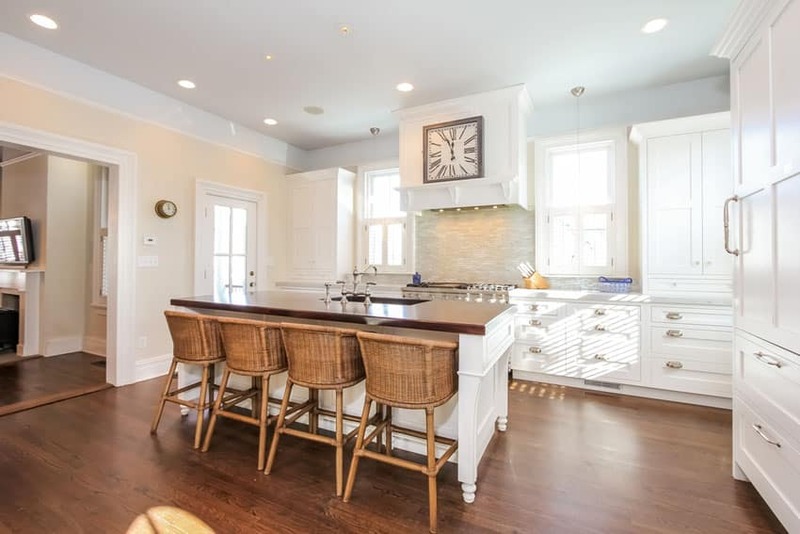 The kitchen island has doors with a beadboard style giving it a nice touch of style and traditional look. This kitchen has a more neutral rustic vibe, as it uses ash wood floors, creating a neutral warm tone in this open kitchen layout. The kitchen is situated in an area directly accessible to the dining and living area, making it look spacious and bright. Light taupe walls is a great neutral background which looks good with the ashwood floors, while the kitchen maintains a simple elegant look white all white cabinets and marble counters. This small gallery kitchen takes its inspiration from blue and white china ceramic, adapting its colors. All kitchen cabinets are white with white marble counter top, while the kitchen island is a movable counter with walnut framing At the end of the kitchen is a unique china cabinet which was painted in a gorgeous shade of blue, reminiscent on the drawings/patterns of blue & white china. The kitchens white cabinets make a nice contrast to the dark wood floors. 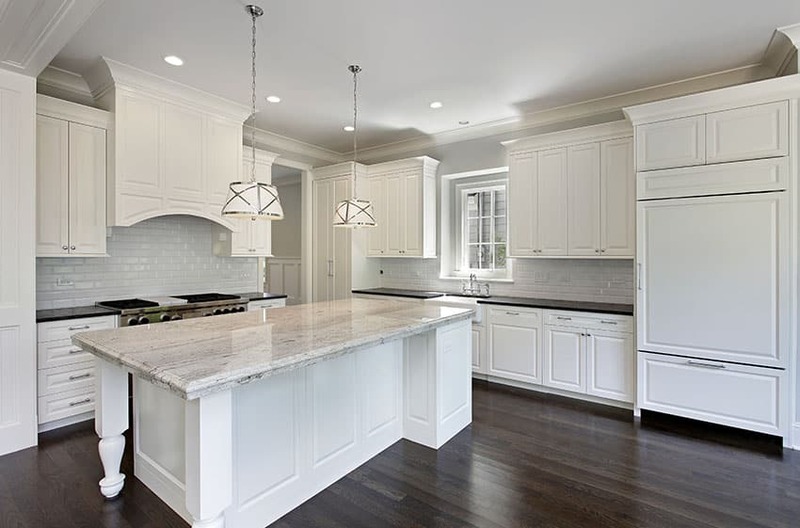 White shaker cabinets are timeless and a great choice for those looking for a classic design that is versatile and compliments practically any kitchen. Shaker style is a cabinet style consisting of a 5 piece door with a recessed center panel. It is the most common cabinet style today which is characterized by simple and functional aesthetics. Despite having a traditional origin, the shaker style is commonly used for contemporary and modern kitchens because of its clean lines. Gorgeous white shaker cabinets paired with mahogany floors and pale yellow walls create a pleasing and soft background color for this kitchen. the combination of colors and finishes brings a very subtle warm glow that brightens the room. The design uses unique mosaic tiles for the backsplash with slight beige and gold undertones, adding an elegant texture to the surface. The movable kitchen island uses solid mahogany for its countertop, as opposed with the marble used on the main counters. Woven rattan bar stools add a light subtle country feel to the space. Kitchens with white cabinets are lighter and brighter giving them an appealing vibe that are highly sought after by many home buyers. In the picture above white shaker cabinets are combined with ash wood floors to give this kitchen space a neutral ashy tone. The wood flooring helps it achieve a subtle rustic vibe. 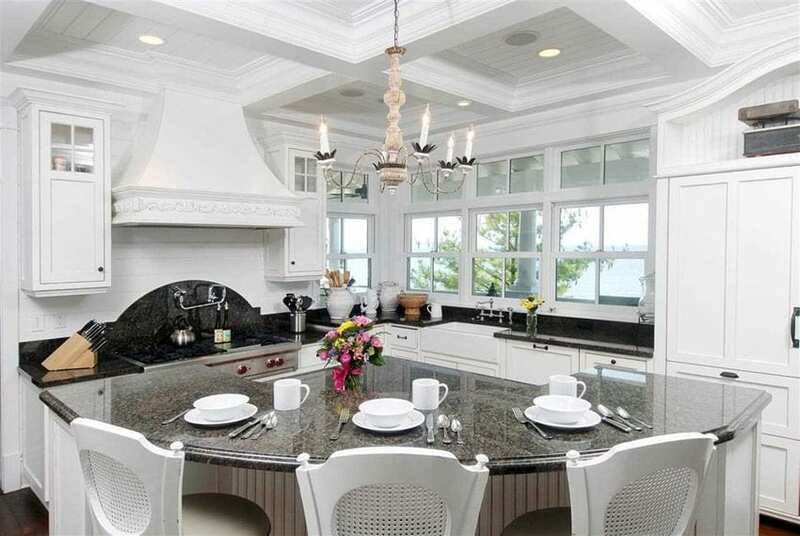 The U-shaped kitchen uses the classic combination of white marble and white backsplash tiles, but what makes this kitchen unique is the dining area placed in the middle of the kitchen. 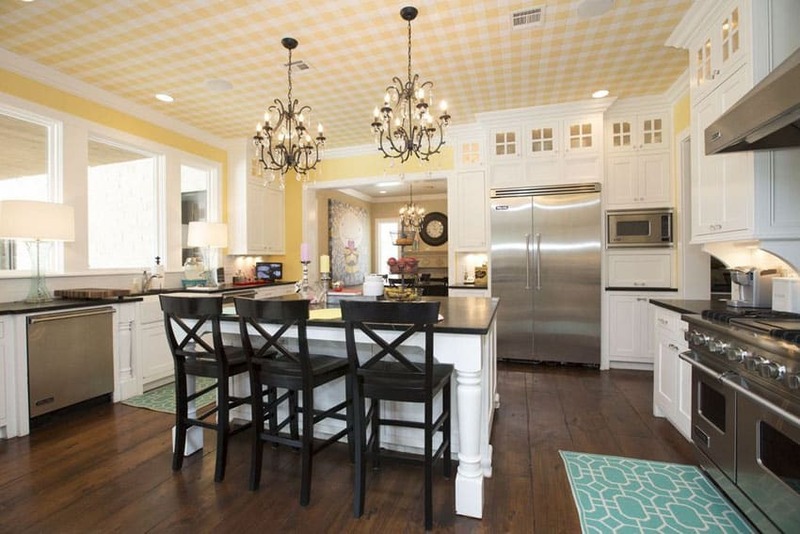 Golden walnut wood flooring gives a classic antique look to this transitional kitchen space. It has a unique and dynamic layout which is able to maximize the transitional space between the formal living spaces and the more private spaces of the home, without affecting the traffic flow. Walls were painted in a refreshing pale green color, which is a good subtle contrast with the warm wooden flooring. For the countertop material, black granite was used for the kitchen island and the bar counter, and white marble for the main counter top. The contemporary kitchen style pertain to the current to present trend which is characterized by minimalism. It usually follows a monochromatic scheme and white cabinets are a popular choice for this design style. Contemporary kitchen cabinets have clean, sleek lines and flat surfaces with little to no ornamentation. There are also no decorative trims such as crown moldings and raised panels. For the hardware,cabinet handles and drawer knobs are simple and do not have decorative accents. The contemporary kitchen style also makes use of mixed materials like metal, concrete, plastic and glass. This creates the much needed variation in texture in contrast for white kitchen cabinets. Stone, wood veneer or laminates may also be incorporated with the kitchen design to add depth to the design. 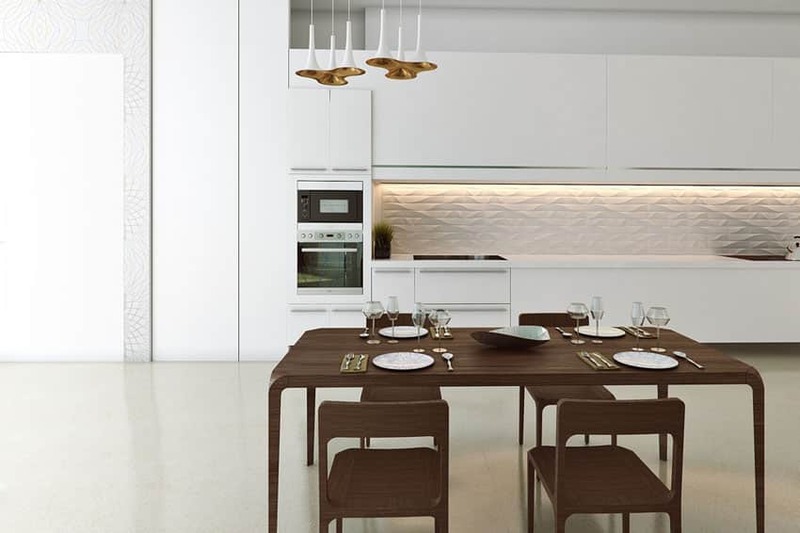 This is a modern contemporary style kitchen uses simple straight lines and silhouettes, creating a clean and crisp look perfect for the interior architectural style. 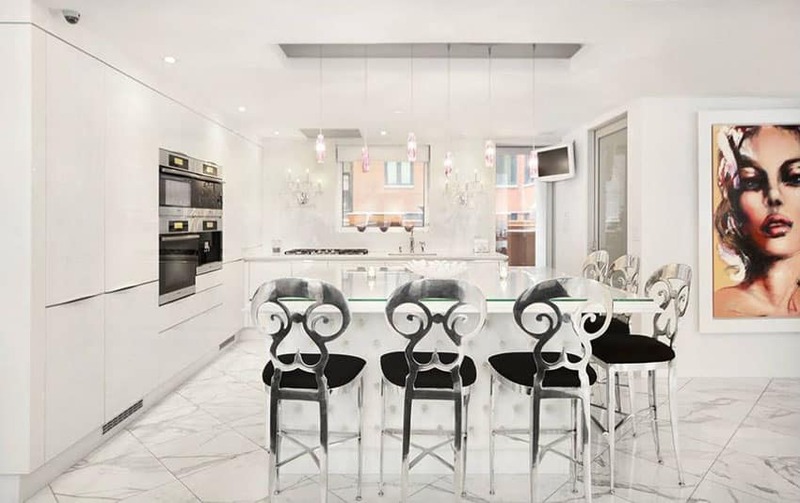 The kitchen uses white high-gloss laminates for the European style cabinets for a very modern feel, while the Carrara marble stone used on the countertops, backsplash and side of the kitchen island gives it a classic touch whilst keeping its modern form. A modern transitional kitchen space which takes inspiration on white French style kitchens but uses straighter, cleaner lines, creating a more modern silhouette. The floors are dark Mahogany with a nice matte finish, giving it a nice contrast. The kitchens have simple panel design, topped with a thick slab of white soapstone. For the backsplash, mosaic tiles with a contemporary brown, beige and white pattern was used, adding a horizontal pattern and texture into the surface which matches well with the color of the flooring. 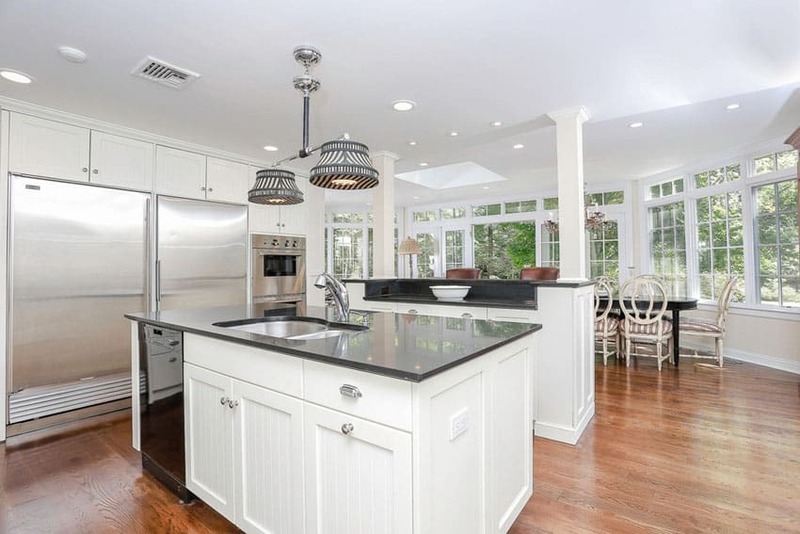 This kitchen also has two kitchen islands, one of which was fixed with a sink, and the other is mostly a flat surface used as additional preparation area. 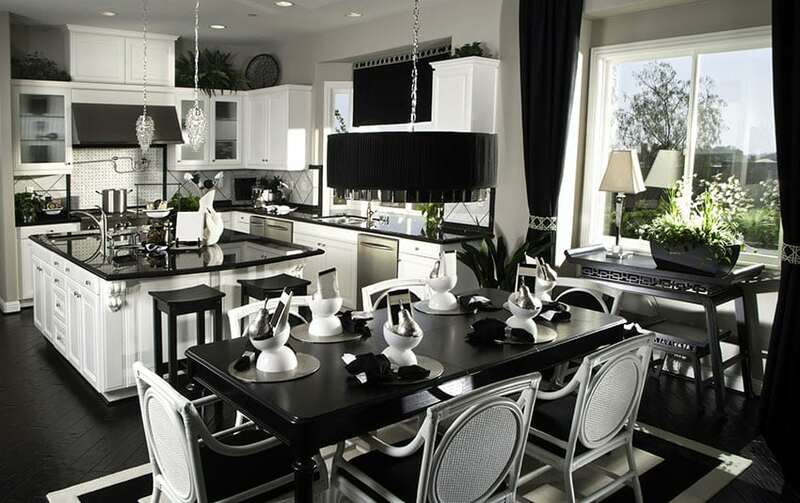 This open concept black and white kitchen design features white cabinetry with polished black granite countertops. The transitional layout flows in to the dining area that matches the overall theme of the rooms design aesthetic. 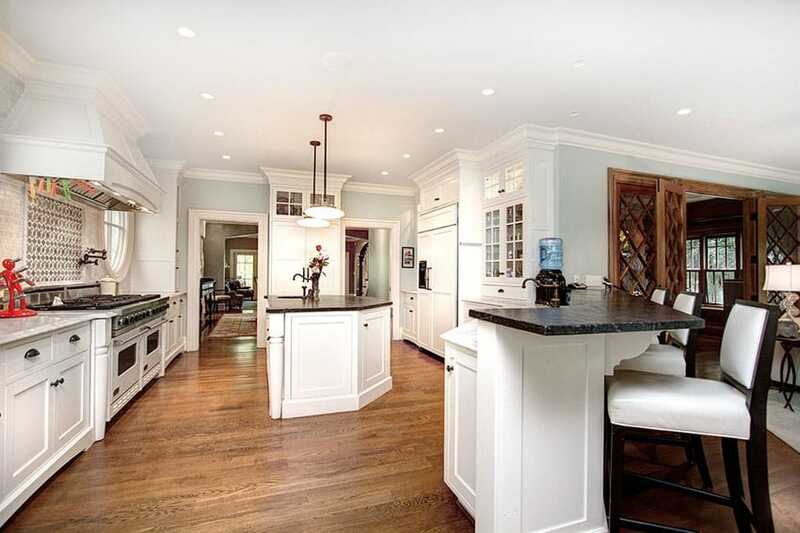 The kitchen has a large center island with decorative wood scroll work and built-in sink. Glass pendant lighting and a modern lamp shade provide some contemporary elements to this otherwise traditional style kitchen space. Glam meets modern in this spacious all-white kitchen design, One side of the wall is dedicated for full-height storage and built-in oven towers, while the other wall is for the basic kitchen counter with white marble. In the middle is a massive square kitchen island with tempered glass top, giving it a modern appeal which looks great with the stainless steel pierced metal bar stools and the modern pendant lamps. This kitchen combines a small L-shaped kitchen with white cabinets with light mocha finished kitchen island. The kitchen island uses gray granite while the main counters uses black granite for added contrast. To add a bit more texture without going against its modern look, gray ceramic tiles with faux masonry design was used for its backsplash. The modern kitchen is characterized by a clean, unadorned look. It is almost similar to the contemporary style which uses flat cabinet surfaces with no ornamentation and sleek design. There are no intricate carvings, decorative moldings or details but instead it is just plain and simple. The modern kitchen style also focuses more on geometric forms ranging from simple angular form to bold curves. Modern kitchen cabinets also combines different materials such as high pressure laminates, veneers or glass, unlike the traditional style which features one type of wood all throughout. For modern kitchens with white cabinets, the ultra modern vibe is achieved by using a high gloss finish to emphasize the sleek surface. Storage space is definitely maximized in this kitchen design, with lots of floor-to-ceiling storage with high-gloss white laminates. 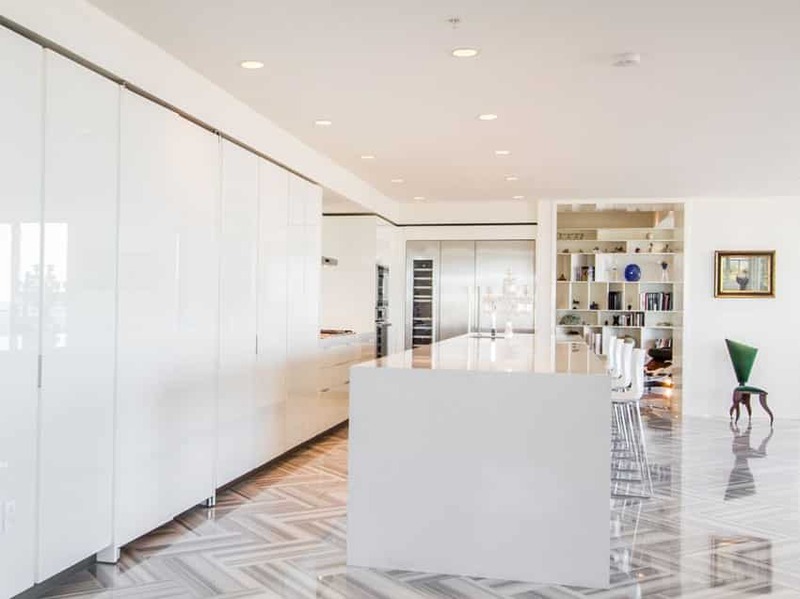 Adding a subtle contrast is the light gray solid surface used on the kitchen island, while the unique ceramic tiles with horizontal gray patterns were laid out in a chevron pattern, adding a unique design to the flooring. This is gorgeous modern kitchen which uses soft subtle colors, creating a warm and clean over-all feel to the space. The kitchen cabinets has glossy off-white laminates and U-channel aluminum for the pulls for a clean, seamless look. 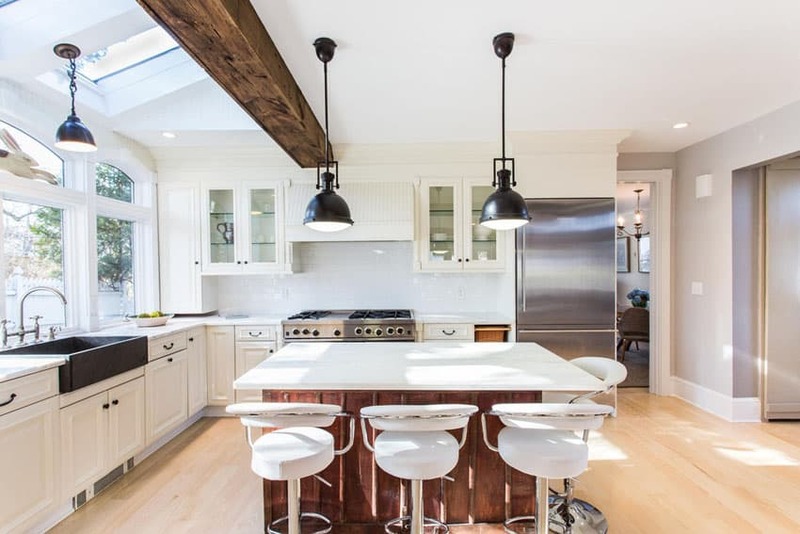 Floors has gorgeous maple wood floors, and the warm white artificial lighting gives the while kitchen a subtle warm glow. This modern kitchen space looks bright and spacious with its minimalist styling and modern, clean surfaces. The kitchen looks seamless as it uses low profile cabinets laminated in white and topped with clean white solid surface. To add a bit more more texture, the backsplash uses unique 3D tiles with a wavy pattern, further accentuated with the use of under cabinet lighting. 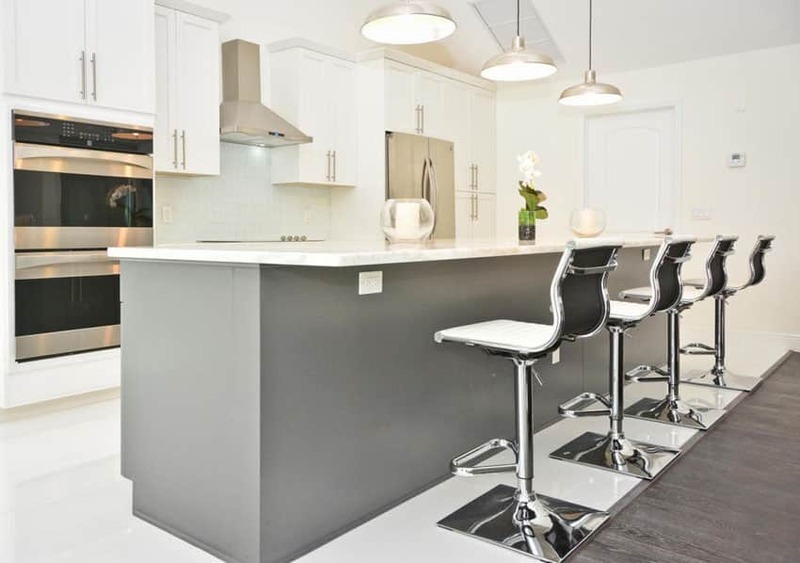 This gorgeous modern kitchen features white flat panel cabinetry with an achromatic color scheme. Floors are ebony wood, while all walls, ceiling and the kitchen cabinet laminates are in white creating excellent contrast. 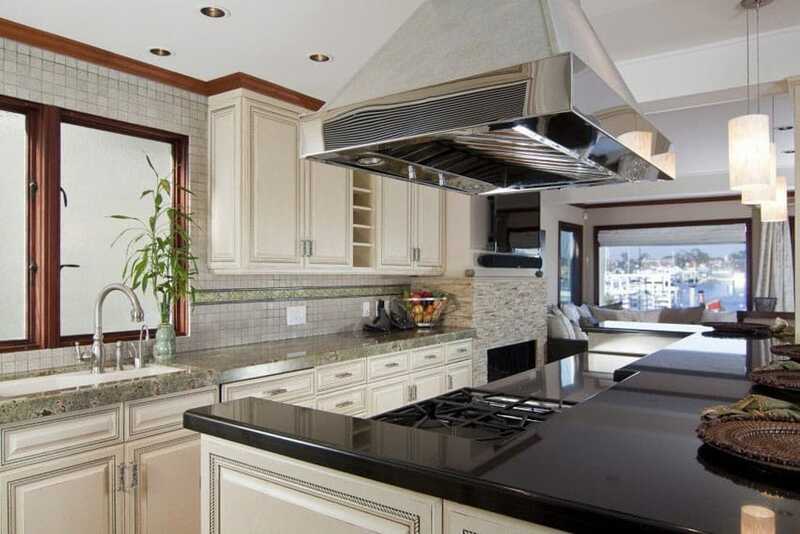 The countertop materials used is black granite, adding a gorgeous shiny surface to the kitchen. 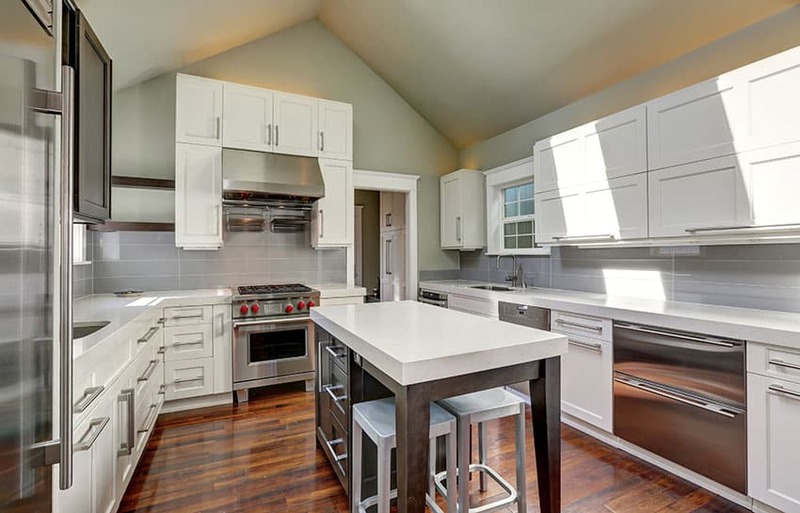 The beauty of having white kitchen cabinets is that mixing and matching the colors for your walls, ceiling, flooring, backsplash and countertop materials are the least of your worries. White is a fail proof color which goes well with almost anything. It has great compatibility with any shade of color, whether it may be a cool hue, a warm tone or neutrals. Think of it as a blank canvass which allows you to freely use anything you like based on your personal preference and unique style. One can never go wrong with white cabinets simply because they are a classic and considered to be timeless. And if you want to change the mood of your kitchen, you can easily do so by repainting your walls in a different color and tweaking up your accessories a bit. 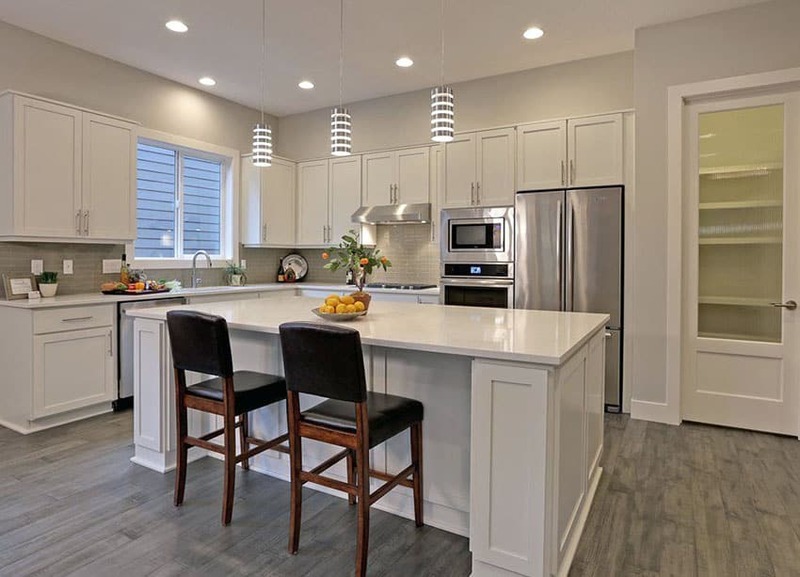 Choosing the right color to go with your white kitchen cabinets will greatly depend on the look you want to achieve and the prevailing style of your kitchen. With the endless choice of colors and the huge design possibilities it offers, formulating the right color combination to go with white kitchen cabinets can get quite confusing. This is simply because you can get too excited knowing that all options may work. 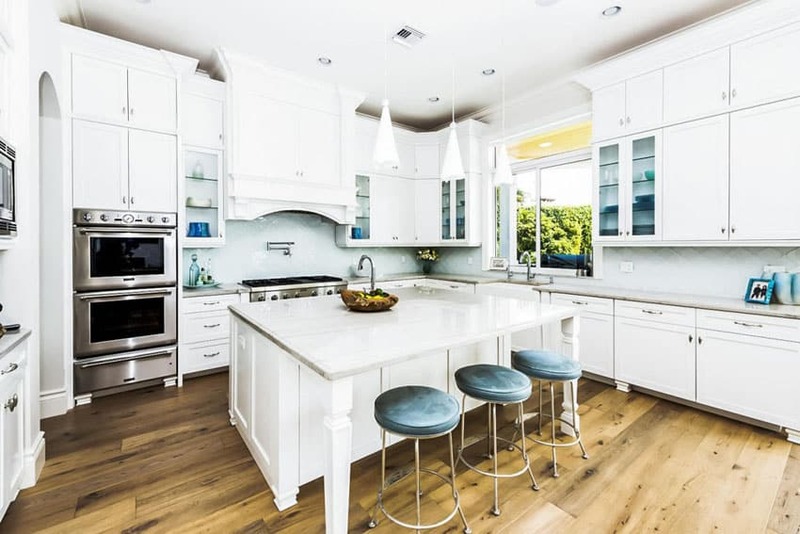 Below we narrow down some of the choices you can explore along with some guidelines on how you can produce a stunning color palette for your white kitchen cabinets. In any type of project, formulating your own color scheme starts with this simple step. When choosing the right paint color to match your kitchen cabinetry, you have to think of the main aesthetic attribute you want to stand out – do you want to achieve contrast or harmony? Both elements produce a different kind of look and give off a unique character. The decision solely relies on your personal taste and preference in style. What is contrast? Contrast is the key element in design composition. It adds depth to a space, creates dimension and variation, making an interior more visually interesting, striking and appealing. Typically, contrast is achieved in interior schemes by taking two opposite colors in the color wheel. However, white is non existent in the color wheel. This is mainly because white is actually a combination of all the colors. Generally, black is perceived to be the opposite color of white. For any design feature that is white in color, contrast can be introduced in a variety of ways, whether through patterns, a change in texture or simply by using any color that originates from the color wheel. To create contrast with white cabinets, you can use bold or deep colors. Bright and vivid colors like shades of red, orange, green or blue work well for contemporary and modern interiors, while rich hues like burgundy, maroon, forest green or navy are best for classic and traditional inspired kitchens. Well of course, you can downplay it a little to achieve an amount of intensity that isn’t too overpowering and to achieve balance for your color palette. Alternatively, you can also choose a muted shades if you want to make the colors appear softer. Contrasting colors also add a splash of color which makes the area “pop” or livens up the mood of the space. For example, a light yellow wall color can instantly make your kitchen feel more warm and bright when added to white kitchen cabinets. It is also important to know a few color basics when choosing the right wall color to match your white kitchen cabinets. Sometimes a color is just too flat and just doesn’t feel right when applied to your walls. However, these colors may either be adjusted into tints, shades or tones to produce more interesting color combinations. Combining tints, shades or tones with white cabinets also produce a contrasting color combination. Tints are created when white is added to a hue in order to lighten it. These colors are usually referred to as pastel colors. Compared to other colors, tints create a softer look, a lighter feel and a more soothing design aesthetic. Examples of tints are pale yellow, cool gray, lavender, sky blue and mint. These mellow colors can be paired with white cabinets if the style of your kitchen is a charming cottage inspired design, a dainty country farmhouse or a coastal kitchen. An example of good color combination using white cabinets and tint wall color is creamy beige panelled cabinets paired with pastel green walls and a solid wood countertop. Shades, on the other hand, are colors which are added with black. The colors can be just a touch darker and does not necessarily have to be very dark in order to be considered a shade. These colors are the opposite of tints and they produce a richer and heavier feel. Examples of shades are navy blue, plum, teal, moss green, wine red, sienna, rust and charcoal gray. When used for interiors, these colors give off contrast and an accent, but they do not deviate from the formality of a space. Shades can be used as wall colors for kitchens which have a classic inspiration or traditional style like historical houses, old world or country kitchens. 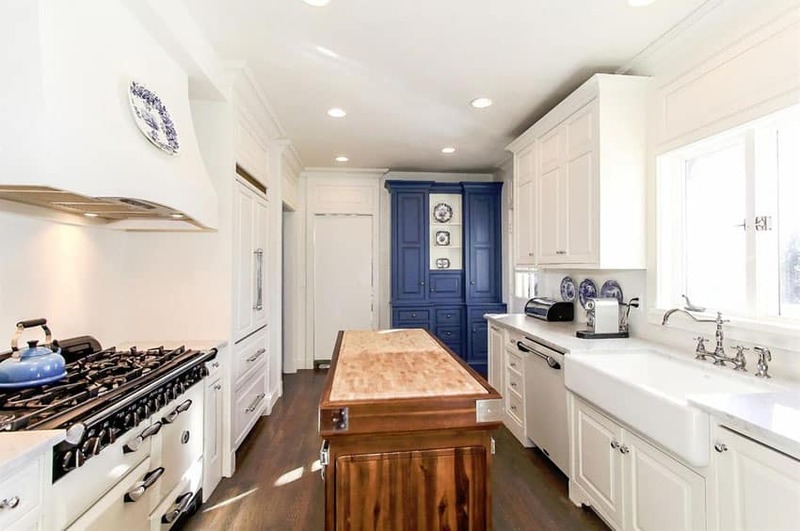 An example of good color combination using white cabinets and shade wall color is white shaker cabinets paired with navy blue walls and an ice white granite countertop. Tones are created by combining a color with both white and black or by mixing it with gray. This makes them more subdued, subtle and muted. Most color are actually created using tones. Basically any color that can be found in the different parts of a color spectrum are considered as tones. These colors provide a pleasing appeal and contributes just the right amount of intensity to an interior. Examples of tones are sage green, taupe, slate blue, mauve and amethyst. Tones can be used as wall colors for kitchens which have a contemporary style. Tones are also versatile and can be use for other kitchen styles, whether they may be traditional or modern. An example of good color combination using white cabinets and tone wall color is semi gloss linen white cabinets paired with taupe walls and a tan granite countertop. What is blending? Blending achieves a harmonious color palette. To obtain this effect in interiors, coordinating colors may be used. Coordinating colors can enhance the colors which are already prevalent in your scheme. Typically for white cabinets, a harmonious blend of colors can be achieved through the use of neutral colors. By definition, neutral colors are colors which are not found on the color wheel like black, shades of gray and brown. White is also a neutral color. Painting your walls with neutral colors is one of the safest options you can explore. Neutral colors are not heavy on the eyes and when combined with a light shade of cabinet color, they do not compete with each other and even with the other elements and finishes on the space. Light browns are beiges are some of the most popular kitchen paint colors for white cabinets.Tan, sand and mocha wall paint also work well with white kitchen cabinets because they introduce a warm undertone. In addition to that the combination of white and brown has a natural coziness to it, making kitchens or any spaces more inviting and welcoming. This color combination is typically used in rustic inspired kitchens, transitional style or contemporary kitchens. Gray is another neutral color which can be used as a wall color for white cabinets. The color gray is considered as the new alternative for white. It is the perfect substitute for those who find an “all white” look too plain or boring. When used as a wall color for kitchens, gray creates a dramatic effect yet it is still subdued and is not overwhelming. 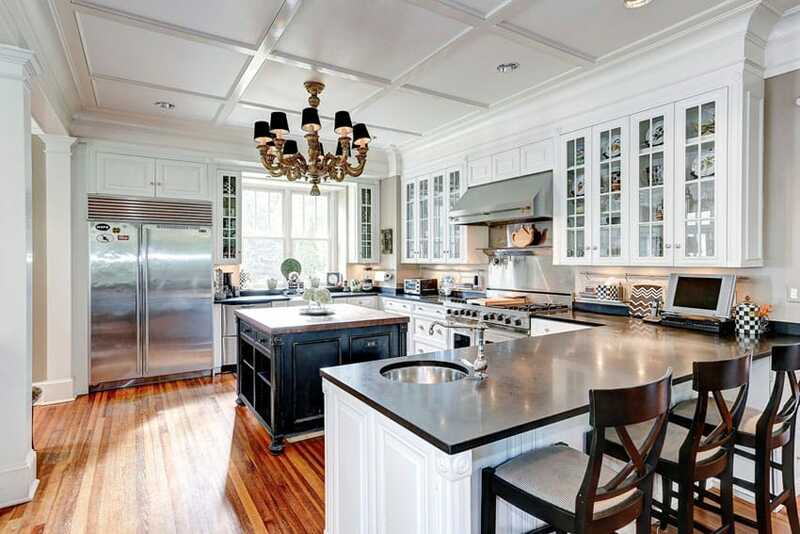 The combination of gray paint and white cabinets also lends a quiet strength to kitchens. 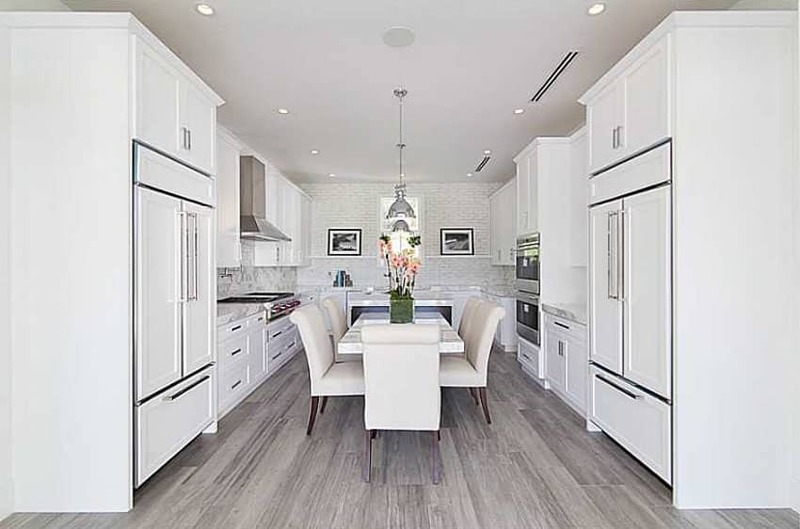 The combination of white cabinets and neutral kitchen paint color also provides flexibility when it comes to choosing accessories and other furnishings. It allows for more choices, unlike when you choose a particular hue as a wall color, your decor is limited. Monochromatic Color Scheme – Monochromatic color schemes include only “one color”. Monochromatic color schemes also make use of a combination of tints, tones and shades of that one particular color group. Just to give you a clear idea of what it is, a bedroom with powdery blue walls, navy blue furniture and coordinating blue accessories is considered a monochromatic palette. White is one of the most popular colors which is used for monochromatic schemes. Contrary to popular belief, white is not a plain and boring color. White does not come in one specific shade alone. It takes many forms, ranging from the brightest ultra white to creamy beige tones, to cooler tints which have a bluish or yellowish tinge. These shades and tones can be combined to produce an all white kitchen color palette that is visually interesting and unflat. An all white kitchen looks clean, crisp and airy. It has a bright ambiance that makes spaces appear bigger. Although more commonly used for modern and minimalist interiors, an all white color scheme may be applied to classic and traditional style spaces as well. Some other shades of white which can be paired with white cabinets are beige, ivory, snow, ghost white, sea shell white, floral white, off white, ecru, pearl, alabaster, frost white and cream. One good example for an all white kitchen is to pair distressed white cabinets with a beige wall and a rich cream colored marble countertop. This will produce an ultra luxurious kitchen that is elegant and sophisticated. Designer’s tip in choosing the right kitchen paint colors for your white cabinets. For small kitchens, stick with a lighter wall color as they tend make spaces look bigger. Using a dark color for a small space can sometimes make it feel to heavy and even tighter. Also, if going for an all white look, choose a countertop which has grains, veins or flecks to avoid that overly monotonous feel. This bright and refreshing transitional kitchen design features a combination of plain white kitchen cabinets and gray base cabinets on the kitchen island. The resulting look is modern and refreshing, even made more interesting with the use of glass subway tiles, and brushed stainless steel accents. The versatility of white kitchen cabinets offers endless design possibilities when it comes to choosing the right backsplash material. White kitchen cabinets work for any kitchen style and are a classic choice when it comes to kitchen design that is why they are appropriate for a number of backsplash materials. 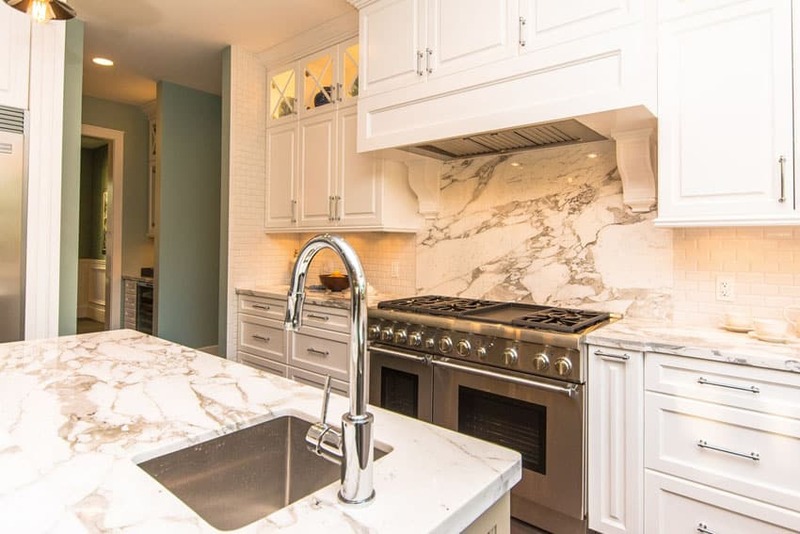 Selecting a backsplash material for white kitchen cabinets is no different from choosing paint colors to match with white kitchen cabinets.They follow the same design approach, which involves either blending or contrasting. You can either create contrast by using a backsplash material with a darker color, while if opting for a more harmonious blend, you can go with a lighter backsplash color. Alternatively, you can also use a white kitchen backsplash to achieve a clean “all white” look, but in doing so, try to introduce variation in textures and pattern to produce a more dramatic effect. Subway Tiles – Subway tiles are small rectangular glazed ceramic tiles usually 3 inches by 6 inches in size and typically in white color. Homeowners love subway tiles for their classic look and low maintenance requirements. When combined with white kitchen cabinets, it produces a clean and uncluttered look which works well for minimalist designs. Subway tiles are also perfect backsplash materials for modern style kitchens as they create a crisp look and render a simple statement that blends cohesively with contemporary settings. When paired with high gloss white cabinets, a subway tile backsplash produces a sense of continuity and a smooth transition. Since subway tiles are one of the most trending kitchen backsplash materials, manufacturers are now trying to produce them in larger sizes like 3 inches by 9 inches and 4 inches by 12 inches. Large subway tiles work well specifically for small kitchens with white cabinets because it creates an illusion of added space. The main advantage of using mosaic tiles for white kitchen cabinets is that it gives a striking visual interest to your kitchen. Aside from that it offers diversity in terms of texture and color. No matter what the blend or pattern is used, a mosaic tile backsplash will surely draw interest from guests by creating an attractive focal point in the space. When paired with white cabinets, dark mosaic tiles, like those in color black, provide a stark contrast which can be ideally used for modern interiors. Earth colored mosaic tiles in shades of brown can be used for introducing warmth to your kitchen with white cabinets. This combination can be used for contemporary, transitional and even traditional interiors. Some design ideas for mosaic tile backsplash are high gloss cabinets paired with black, gray, white and red mosaic tiles for a bold kitchen interior with a modern vibe. Another example would be distressed beide cabinets paired with natural stone mosaic backsplash of shades of brown, beige and warm terracotta undertones for a rustic inspired kitchen. Tiles – Ceramic tiles are also one of the most conventional backsplash materials. It is popularly used because of its aesthetics and practical benefits. Tiles area easy to clean, durable and easy to install. When it comes to design, tiles offer large selections as they are available in a broad spectrum of colors and a wide array of patterns. It can either be ceramic or porcelain, polished, semi polished or honed in finish. If opting for a monochromatic color scheme for your kitchen, tiles can work well as a backsplash material for white kitchen cabinetry because it also offers variation in textures. 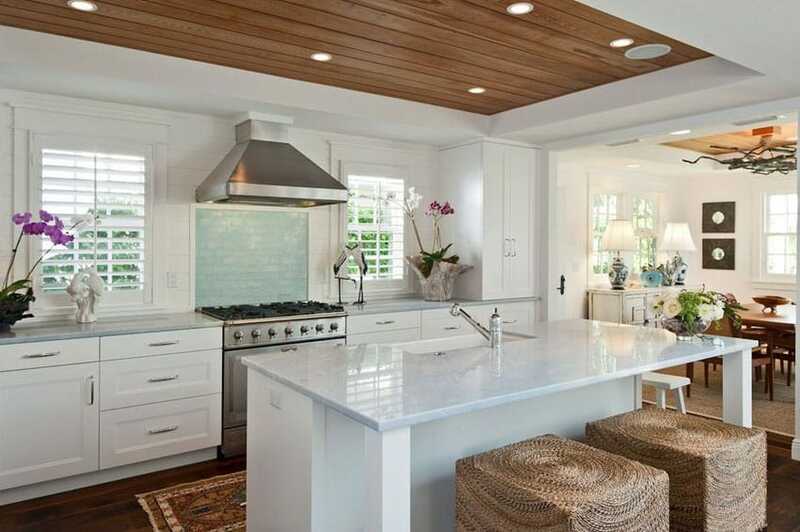 Opt for white tiles which have a different “feel” to create contrast and make the kitchen palette less monotonous. For modern kitchens, a classic “black and white” combination may also be explored. This pairing exhibits a stark contrast which is elegant and can stand the test of time. For example, try pairing satin white cabinetry with high gloss ceramic tiles for a kitchen setting that has a contemporary vibe. Natural stone – Aside from granite, there are also other natural stone options which can be explored as backsplash material. Marble, travertine and slate are among few of its examples. Marble is a type of natural stone that is characterized by its rich veining pattern and smooth surface. Typically used as a countertop material, marble also works well as a backsplash materials for traditional inspired kitchens. If you are aiming for a minimalist yet classy overall look for your kitchen, then this is the perfect material for you. It works well as a backsplash material for white cabinets as it adds a luxurious touch even to small kitchens spaces. It is best paired with plain white cabinets because the simplicity does not compete with the natural beauty of marble to stand out. 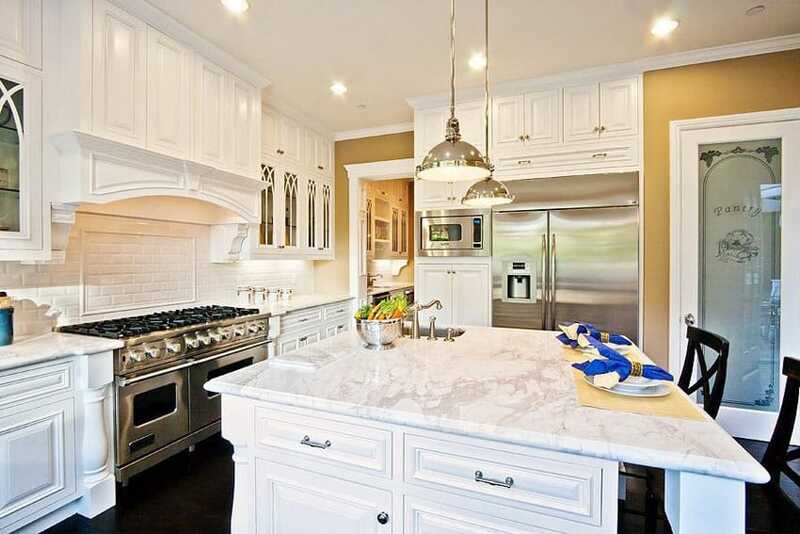 However, a marble backsplash can also be paired with exquisite craftsman style kitchens for that ultra rich feel. Slate is another type of natural stone which is characterized by its bluish, green, gray and rust color. It is the perfect backsplash material if you want to add warmth and texture to your kitchen. Commonly used for rustic inspired, traditional and old world style kitchens. A slate backsplash is best paired with antique white cabinets or off white cabinets with millwork and paneling details. Travertine is another type of natural stone which is made up of limestone and usually white or light colored. It also has warm undertones which are brown or light tan in color. If you do not want the color of slate but like the distinct beauty of natural stone, a travertine backsplash is the one of the materials you can explore. It contributes warmth, a subtle accent color and an old world flair to your kitchen. Just like slate, a travertine backsplash is typically used for rustic inspired, traditional, antique and country style kitchens. A travertine backsplash is also best paired with antique white cabinets or off white cabinets with millwork and paneling details. Glass – Glass is considered to be a modern kitchen backsplash material. A form of glass known as graphic coat class or back painted glass is the most common type of glass used for this application. Aside from being low maintenance, glass became known as a backsplash material because of the endless design options that it offers. It comes in different colors and textures which add an interesting visual aesthetic to your kitchen. It is more commonly used for modern and contemporary settings as its sleek and ultras smooth look is the perfect complement to minimalist design. A bright colored glass backsplash can be used to accentuate an ultra white kitchen cabinetry. This pairing adds a modern touch and a stark contrast to retro, contemporary or ultra modern kitchen designs. Explore colors for your backsplash material. 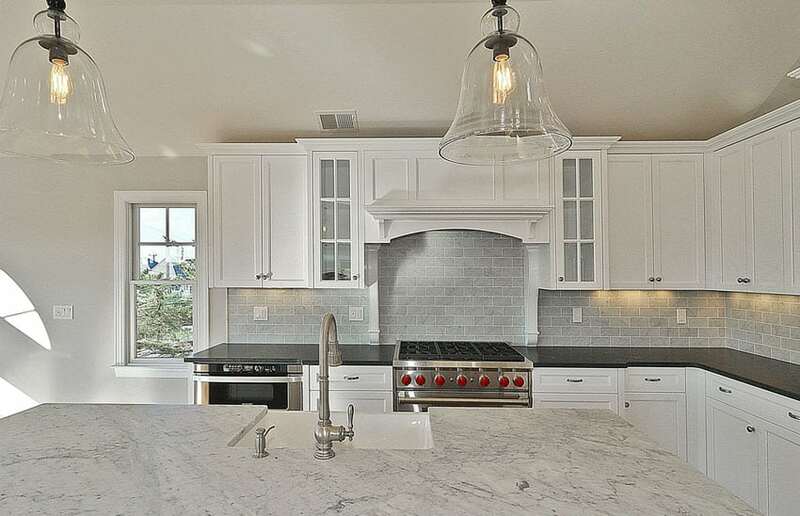 Generally speaking, any color of backsplash material can work for white kitchen cabinets. Your choice will greatly depend upon the overall look you want to achieve and the style you are going for your kitchen. Typically, people are used to a neutral backsplash color, like white, cream, beige, off white, shades of brown or gray, but alternatively, you can be more experimental when it comes your color choices. A backsplash is a good way to introduce an accent color for your scheme. A splash in color can instantly make your kitchen more lively and bright too. Also, keep in mind that colors may be used to express different moods for your kitchen setting. To convey, luxury or formality, go for a backsplash with subdued colors like gray or black. If you want to add an airy feel to your kitchen but want to deviate from an all white kitchen palette, you can use a light colored backsplash like a refreshing pale blue shade with teal accents or a mellow shade of green. If you want to create energy and make your kitchen more inviting, try a bright red backsplash for your kitchen cabinets. Also, you can either stick with a single color or produce a unique blend of hues which can make your kitchen more visually attractive and one of a kind. Explore different cuts and layouts for your backsplash material. You can always substitute a plain backsplash with a newer twist by exploring different patterns and layouts for your kitchen. Typically, a traditional kitchen opts for a classic uniformly laid layout and pattern, however if you want to take your design into greater heights, try experimenting with the pattern like a chevron design, diamond pattern, stripes, etc. Also, if gearing towards a more contemporary and modern setting, you may opt to have your tile or natural stone backsplash custom cut so you can create a more unique layout. Introduce patterns to your kitchen using your backsplash material. White kitchen cabinets are the perfect backdrop for a patterned backsplash because they do not compete with the “busy” look of printed tiles or bold patterns. Also, white cabinets work effectively well in highlighting the beauty of patterned backsplashes. A current design trend for backsplash designs are graphic tiles in different prints or geometric patterns. If you want to create a statement and make your backsplash the focal point of your kitchen, opt for ceramic tiles that have a unique print. The prints do not necessarily have to be bold colored to create a stunning statement with white kitchen cabinets. White tiles with white graphic prints are equally visually interesting too. They add a significant amount of diversity in terms of textures and work particularly well for modern and contemporary inspired kitchens. Details and accessories are also equally important when it comes to producing a well balanced and cohesive design. Cabinet hardware such as handles, pulls and knobs are considered as the “jewelry of the kitchen”. They are essential in kitchens not only because of their functionality but also because of the aesthetics that they add to kitchen designs. Cabinet hardware protect your cabinets from the dirt coming from your fingers and they help you open or close doors with ease. When it comes to aesthetics, the perfect cabinet hardware can also enhance the look of your cabinet face. Cabinet hardware are available in a myriad of styles and finishes that can be use to complete the overall look of any kitchen style. Aside from the profile, shape and size, the color and finish of a cabinet hardware is one of the factors that one must decide on when choosing the right cabinet hardware for your kitchen. The common finishes of cabinet hardware are brushed nickel finish, satin finish, chrome finish, antique pewter, light bronze or dark bronze, brass, oil rubbed bronze, aluminum, matte black, rust, clear glass, wooden finish or white. Although there is no general rule in choosing the right color of cabinet hardware to match, one fail proof approach is to choose the type of cabinet hardware color and finish depending mainly on the prevailing style of your kitchen. Most homeowners tend to match every finish in their kitchens. However, you can try to mix and match things differently to create a design that is more interesting. There is no need to match every finish and also your faucet does not necessarily have to be the same but make sure that they complement each other. Another approach to choosing the right cabinet hardware to go with white kitchen cabinets is to coordinate the finish and color with the appliances. Black knobs and oil rubbed bronze can be matched with black appliances while brushed nickel or satin stainless steel pulls may be matched with stainless steel appliances. The most popular cabinet hardware color brushed nickel or chrome finish for their kitchen cabinets. Used in both traditional and modern styles, brushed nickel hardware can be used in paneled white kitchen cabinets or even high gloss white kitchen cabinets. Shaker cabinets for transitional and classic inspired kitchens are known for their simple design and clean lines. White shaker style kitchen cabinets are often paired with unornamented hardware to complement their simplicity. This pairing can be used for both modern inspired or vintage themed kitchens. Alternatively, glass and ceramic knobs may also be used to pair with white shaker style cabinets. 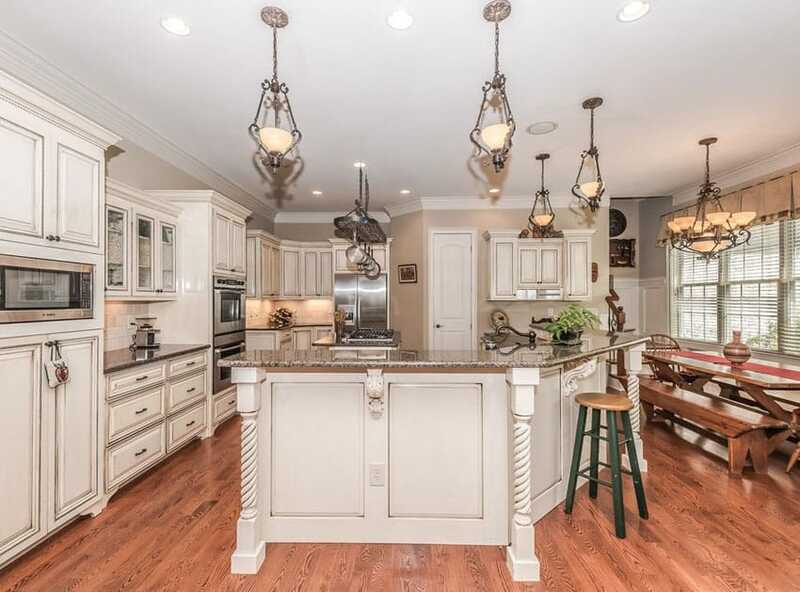 Craftsman style kitchens or traditional kitchens with heavy millwork and crown moldings are usually featured for classic or country inspired designs. 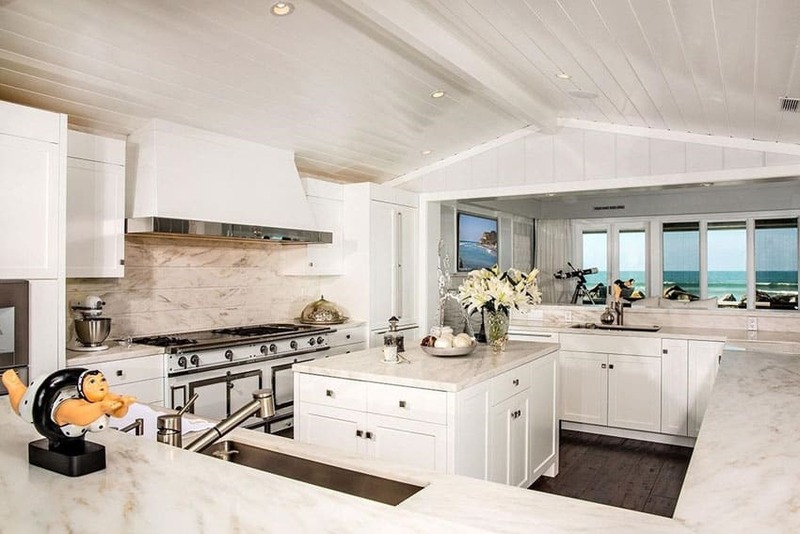 They often use off white or beige cabinetry or cabinets in distressed white finish. To complete the old world feel of a space, opt for an antique cabinet hardware. Some cabinet hardware color or finish which goes well with this design are antique brass, oil rubbed bronze and distressed white. For modern kitchen with sleek ultra white cabinets, choose handles which have a tubular form or a streamlined profile. Nickel or stainless steel in brushed, satin or chrome finish are often seen in flat panel doors. Flat bar pulls in brushed satin finish are also prevalent in modern style white kitchen cabinets. For an all white kitchen, cabinet hardware usually serve as one of the focal points in the design because they are more noticeable. It is the perfect way to introduce contrast in a monochromatic scheme. For traditional all white kitchens with white cabinetry, go for antique brass hardware or black handles as they render a striking contrast which makes your space less monotonous.